Playing computer and video games on a daily basis is popular among children in each age group (58% of 5-7s, 68% of 8-11s and 59% of 12-15s). Among 8-11s there has been an increase from 59% in 2010. Interesting that the use is so high amongst the younger 8-11s. Note that is a daily figure. Compare that with 16-19’s across the EU had a 83% rating, but that was not the daily figure, but in last 3 months, or to the US figure of 17% of 5-8 year-olds playing games daily. If you asked those age groups who had played an online game not daily but in the last 3 months, I bet the figure is almost at the 92% who use the net. These figures mean online games are very, very common. So how to parents feel about all this gaming? Parents of 5-15s are most likely to be concerned about the television content their child watches (31%), compared to internet content (23%), mobile phones (16%), games (19%) or radio (5%). Levels of concern at the overall level for each medium are unchanged since 2010. … Parental controls are unlikely to be in place for either handheld games players (12%) or games consoles connected to a television (15%). Not as concerned as they are about TV… This surprised me given the ongoing scare campaigns that sections of the media like to wage against games. We asked parents and children a number of questions to find out about the devices they use to play games at home. Games consoles connected to a television and handheld/ portable games consoles are the most commonly-used devices for gaming; used by at least six in ten children in each age group. Compared to 2010. Most children in each of the three age groups use at least one of the devices we asked about to play games; accounting for close to nine in ten 5-7s (86%), and nine in ten 8-11s (93%) and 12-15s (90%). 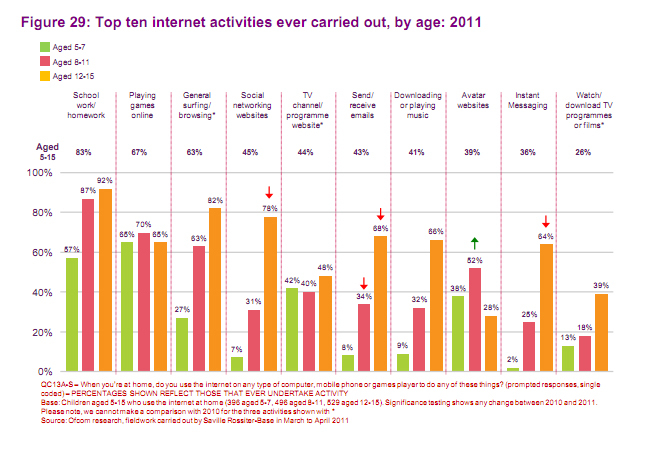 Doing homework is the most common use of the Internet (83%) and gaming is next (67%). The full report is here: PDF link. ← Cthulhu Thursday: Making Dark Young!